Pit beef – a somewhat tough cut of beef roast turned into delectable sandwiches – is not “true” barbecue… there’s no smoke added to the beef. The meat is grilled using both direct and indirect cooking making exquisitely tender beef – crispy edges with a rare interior – a classic sandwich from the east side of Baltimore. Combined with a horseradish-mayonnaise aioli-style sauce, called Tiger Sauce in Baltimore and parts of Maryland (this “Tiger Sauce” is not the same as the bottled sauce of the same name), and thinly sliced raw onion, the combination creates a great sandwich. 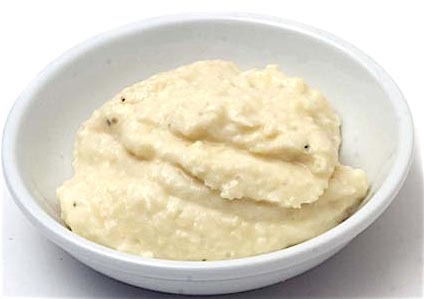 The recipe is a three-step process: make the horseradish sauce; prepare the BBQ sauce (if using) and cook the beef. Whisk all the ingredients together in a small bowl. Season with salt and pepper. Cover and refrigerate for at least one hour. 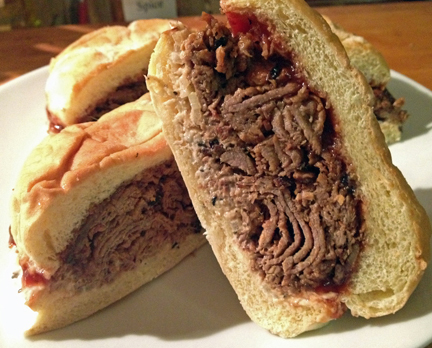 Traditionally, Pit Beef sandwiches are served with only Tiger Sauce and sliced raw onion. I like to add a thin BBQ-style sauce but the choice is up to you. Melt the butter in a medium saucepan over medium heat. Add the onion and cook until the onion wilts, about four minutes. Do not brown the onion. Add the garlic and cook until fragrant. Add the ketchup, mustard, vinegar, Worcestershire, molasses and hot sauce. Stir well to combine. Simmer for five minutes, stirring often. Whisk in the pepper, salt and chipotle. Simmer for two minutes. 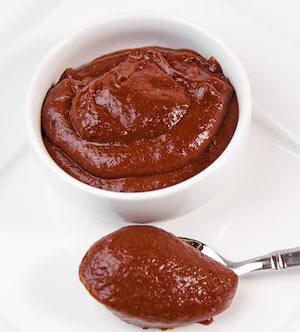 Although not necessary, the sauce could be puréed using a small food processor or immersion blender. I like serving mine with the small onion pieces in the sauce. This sauce would also work well for pork or chicken. 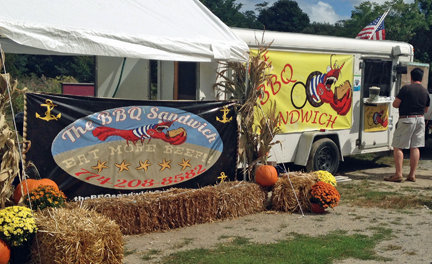 Adrian Vickers, the owner of The BBQ Sandwich (suitably located in Sandwich, MA) and a former Baltimore resident, has an “All Shark Sauce” he serves with his pit beef sandwich if requested. 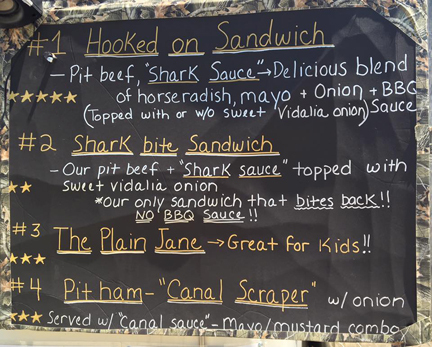 He operates a roadside food truck (actually a repurposed 16-foot construction trailer) four days a week from spring “until the temperature drops below 30 degrees.” Although he declined to provide the “All Shark Sauce” recipe, he described the sauce as “a 55-gallon drum of dignity. A swimming pool full of pride! And two arms full of family love and tradition.” He did say his BBQ sauce is a commercial preparation. Generously sprinkle all surfaces of the roast with the rub and wrap in food film. Refrigerate for at least four hours or up to two days. Remove the roast from the refrigerator and pat dry. Season the roast with another layer of rub. 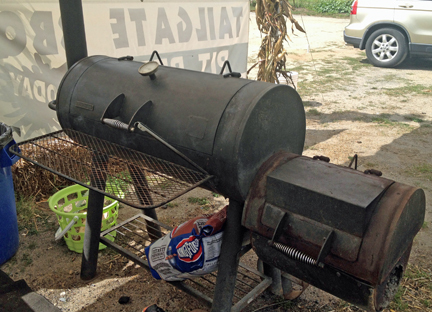 As traditional pit beef is not smoked, I opted to use my venerable 15-year-old Broilmaster P-3 propane grill instead of my Yoder YS-640 pellet cooker. While I could have used the Weber Smokey Mountain or Grill Dome Infinity XL, I didn’t want to deal with lighting hardwood charcoal so gas was the way to go! Prepare the grill for two-zone cooking. Bring the hot side of the grill to about 450 degrees F. and the cooler side to 325 degrees F. and turn off that burner. Place the meat on the direct-heat side of the grill. Cook (uncovered) for three to four minutes on each side of the meat. You want to develop a good char on the beef. Slice each roll in half crosswise. Slather the cut sides with Tiger Sauce. Add a layer of thinly sliced onion and pile on about six ounces of the sliced beef. Top with BBQ sauce, if using, and serve. Combine all the ingredients in a small mixing bowl. This rub, covered, will keep for up to a month before losing its flavor.